In a previous blog post I noted that Ernst Haeckel's first phylogenetic trees (published in Generelle Morphologie der Organismen, 1866) were distinctive in that many, if not most, of the labels occur in the spaces between the terminal twigs, like seeds enclosed within a fruit. In contrast, most other phylogenetic trees, both then and now, distinctly label the individual leaves/twigs. I have, however, come across the Haeckel-like design in at least one recent place: the Darwin's Library blog for 19 April 2010. Note that the figure, reproduced here, is actually a network, as the branches fuse in at least two places, indicating hybridization of ideas. Mathematically, I guess that we could best interpret the labels as referring to the nodes rather than to either of the two terminal twigs. 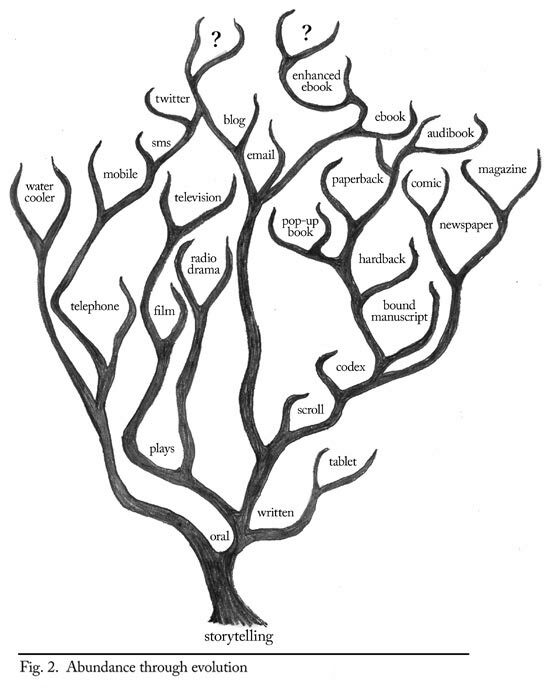 This phylogeny contains one other intriguing feature — the branch leading to both "email" and "blog" diverges from the branch leading to "scroll" and "codex", whereas I would have thought that blogs would be related to "newspaper" and "magazine", for example, which are descendants of "codex". Emails are related to letters, which do not appear in the phylogeny, but could, I guess, be on the long branch leading to "email".